A programme set up by a Kingston University professor shares design knowledge that gives people the insight and confidence to fix everyday challenges for others and for themselves. 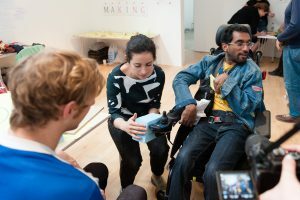 Fixperts is a creative social campaign and design education programme that inspires designers – the ‘Fixperts’ – to help people solve the problems they face – the ‘Fix partners’. The Fixperts’ creativity and knowledge of the design process allows them to apply ingenious, flexible and low-cost solutions to their Fix Partners’ challenges, delivering immediate and positive impact on their everyday lives. The whole process is captured through short films, which are shared on the programme’s website for anyone, anywhere to watch. To date, 250 Fixperts films from around the world have been uploaded to the website, offering a growing resource that contributes to design education. The films have been viewed over 400,000 times and have also featured in mainstream media from Berlin to Calcutta. The programme also collaborates with schools, universities and colleges across the world to run Fixperts as part of their courses. Dear Kingston Uni Fixperts teamstnd thought team design effort is a great idea. I am a retired ESL teacher and have been feeling the recent arthritic effects of an old sports injury which now limits my movement a lot. I was wondering if you be so kind as to help (me) design a simple electric folding aluminium chair with little wheels attached to the bottom of each chair leg? I’m 44 kilos and 152 cm tall. The kind of chair I had in mind is a cheao and cheerful one since I’m smaller than average and would be used only on pavement. If you could help me I would be very grateful. Many thanks for your kind attention to this.